Discovering winged termites in your home is a sign of infestation. Termites cause structural deterioration and greatly affect the value of your property. These winged pests often move from one place to another, damaging anything that gets in their way. Termites breed and start colonies when spring comes and the weather turns humid. Exterminating these pests immediately is important to preserve your home. How can you prevent termite infestation? 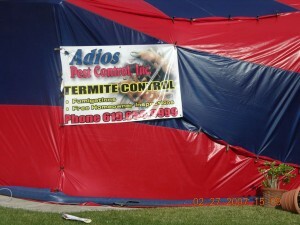 Adios Pest Control provides complete solutions to your termite problems in San Diego. We are one of the leading San Diego termite control companies in the county. Our team will conduct fumigation, inspections, treatments, and repairs to areas damaged by these pests. Termites may come back as long as you have wood in your home. We perform full exterminations, leaving no reason for termites to come back. Our fumigation services deal with dry wood termites, bed bugs, and other types of wood-destroying pests. We use tarpaulins and industry standard fumigants that penetrate the core of wooden structures to destroy these pests. In San Diego we also offer termite inspections and structural repairs. Our team will distinguish different termite species so you can choose the most appropriate treatment for your home. We even provide termite prevention plans to make sure swarms won’t infest your home when the weather turns humid. Contact us to learn more about our services in San Diego and surrounding areas or call at (866) 955-7378.